Information on this website and on the Voice Care for Teachers DVD is not intended to be used to diagnose or treat any voice problems or used as a substitute for professional help. Any person with concerns about their voice is strongly encouraged to obtain appropriate professional advice relevant to their particular circumstances. 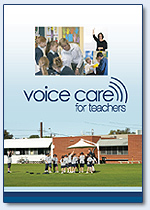 Information provided on this website and on the Voice Care for Teachers DVD is considered to be true and correct at the time of publication. Voice Care for Teachers is subject to the Privacy Act 1988 which requires that we comply with the Information Privacy Principles (IPPs) set out in the Act. The IPPs set out how agencies should collect, use, store and disclose personal information and how individuals can access records containing their personal information. We will only record your e-mail address if you send us a message. It will only be used for the purpose for which you provide it. In particular, we will not add it to a mailing list unless you request that this be done nor will we disclose it without your consent.